The statistics for 2018 for the Seven Circumstances book blog illustrate some basics about the world of book writing, publishing and reviewing. Many factors impact how many “clicks” (views and visitors), likes and comments a site like this gets. In a previous post I discussed two of the lessons I’ve learned from this, namely why Search Engine Optimization matters and how it works, and that the context in which a book has been produced can be as interesting as the book itself. In this post, I conclude with the factors of timing and synchronicity, and the actual meaning of the numbers of clicks. Just like the success of a new film depends on the timing of its release, so too does the success of a new book depend on the publication date and the publication of reviews of that book. Reviews are a critical part of the marketing of books and they are written well before a book actually hits the market. The influence of wider political and social contexts is particularly evident when a world event coincides with the publication of a book that has a related theme – think of the publication of the memoirs of both Michelle Obama – Becoming, 2018, and Hillary Clinton – What Happened, 2017. Another example of this would be the increased visibility and importance of minority identity and politics, which coincided with Esi Edugyan writing her novel about slavery, Washington Black, and subsequently winning the 2018 Scotiabank Giller Prize for Literature for it. Apart from the reception and interpretation of a novel being influenced by the world at large and the march of global events, it is evident now that everything, including writing, publication, reviews and critical responses, are happening so much faster than ever before – and everything is connected. No author or reviewer can ignore the forces of synchronicity impacting their work. The words you blog today will be all over the world in a few hours. Your tweets will reach people and places you did not think possible. And quickly too. Someone will write to you about your novel from some part of the world where you didn’t even know your book had been sold. And you might think that the world you created in your book is uniquely yours, and important only to you, only to find out that you are part of a larger movement of likeminded people. Recognizing this, I have moved away from the passive luxury of having a website with only pages, that cannot really be tagged and that do not require refreshment or updates. Now, all new information on my site is in the form of blog posts. Secondly, I repost many of my articles or blog posts onto other Social Media sites like Tumblr, LinkedIn and Goodreads. 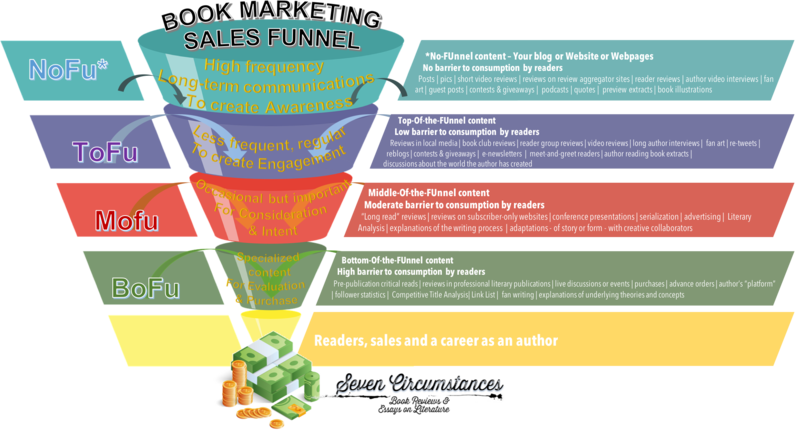 The effect is that many readers are redirected from those sites back to Seven Circumstances. Unfortunately, it means that I have to reformat and partly rewrite posts before I can repost them. Nevertheless, a static website, with no links or text tags, is as good as dead. It means no-one links in to your site unless they search specifically for you. You might as well be a Luddite and publish your book or your review in paper form and then sit back and wait for something to happen. And precisely nothing will happen. As the authors I’ve spoken to have said, to get your book read and reviewed, means being very active on the internet, all the time. So, I have indexed the pages to be searchable, and keep refining the search functions and indexes on the site. For the past year I have started blogging consistently and frequently. On average, I post something new every week. It’s not my day job but it sure feels like it! And if there is a tie-in of a book to a current event, like a film or a conference, then I time the post of the review to the event. I can imagine those 35,000 instances of clicks that led to those 23,000 people reading something on this site. Ooh, that’s a lot!! And I can imagine the more than 100 people (bloggers) who follow this site. Ooh, that’s a lot too!! But, then reality kicks in. Firstly, this site is a midget, a speck, an insignificant molecule in the enormous expanse of the Internet, and compared to other book sites. When I break down the numbers further, thanks to WordPress’s analytics, I know that a proportion of these clicks and hits must be fake – how much, I don’t know. They are from other website operators who are also trying to get more traffic to their websites – and have no interest in literature or books. They are from bloggers that do not have real blogs but websites set up to sell something. They are from spam merchants, phishers and other horrors. The ugly side of this kind of blogging is the constant attacks on your pretty, honest and rock-solid site by people who practice “Black Hat SEO”. The “Black Hat” term in SEO comes from the old cowboy myth of the bad guys wearing black hats and good guys wearing white hats. Here are “Black Spy” and “White Spy” from the old Mad Magazine. 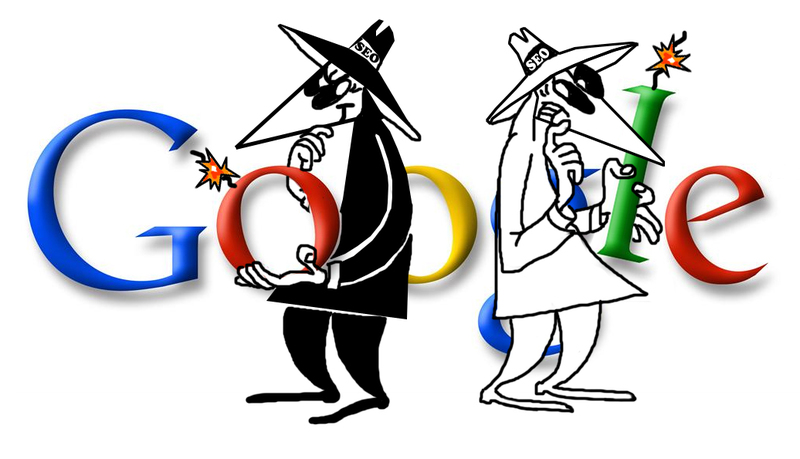 For one, I constantly clean up my site text and images to prevent Google thinking it is a Black Hat site. Ironically, if you use too many of the same tagged words, or repeat them too often, Google might think you have a Black Hat site. This is hard to avoid if your site is highly specific, like mine is. I reckon the words “novel” and “fiction” occur so often my site might be mistaken for a devious book seller. Secondly, I spend literally days every couple of months to clean up and delete broken or suspect links in and out of the more than 3,000 pages on this site. This week alone I had 51 broken or suspect links to clean up. That’s 51 pages to work through, test and reformat. Fifty-one broken links are what the search app could find in 3,000 pages, though there are more pages than that, and hence, more broken links that I don’t know of! Summary – What did I do to get this site to grow? What I realized is that at the end of each of those links, at the other blogs and websites of those people who click on and follow this site, there are real people. Not many, but real people. People who write books, for whatever reason, people who are working on books or are trying to self-publish them, people who love books and reading, people who just like writing stuff. I focus on these few, real people. I am very, very good, by this time, at distinguishing the real writers, poets and readers from the fake ones. And this realization has led me to making contact with fantastic new authors like Ruuf Wangersen, Jon Gliddon and Josiah Bancroft. And that has been a real eye-opener and worth every moment I spent writing about them. To these real people – you know who you are – I say thank you and wish you an excellent 2019.